On Saturday November 17, a contingent of Ironworkers and other union members joined in protests against a fascist rally that targeted women who dare to speak up against sexist harassment and abuse. The heavy police presence deployed by Portland’s Democratic Party government menaced anti-sexist protesters, arresting half a dozen and shoving us off city sidewalks with riot clubs and an arsenal of lethal weapons, protecting the small band of fascists. CSWP fights in the unions to break with the bosses’ Democratic Party, and for union-based workers defense guards to lead mass worker/black/immigrant mobilization to sweep the fascist scum off the streets. We distributed the following leaflet. Mobilize the Power of Labor to Defend Women’s Rights! On November 17th, a group calling itself #HimToo wants to use Portland as a platform to intimidate and harass women. Make no mistake: the sponsors’ talk of “men’s rights” and a “war on men” is in fact a battle cry for an attack on women by ultra-rightist, racist and outright fascist forces. 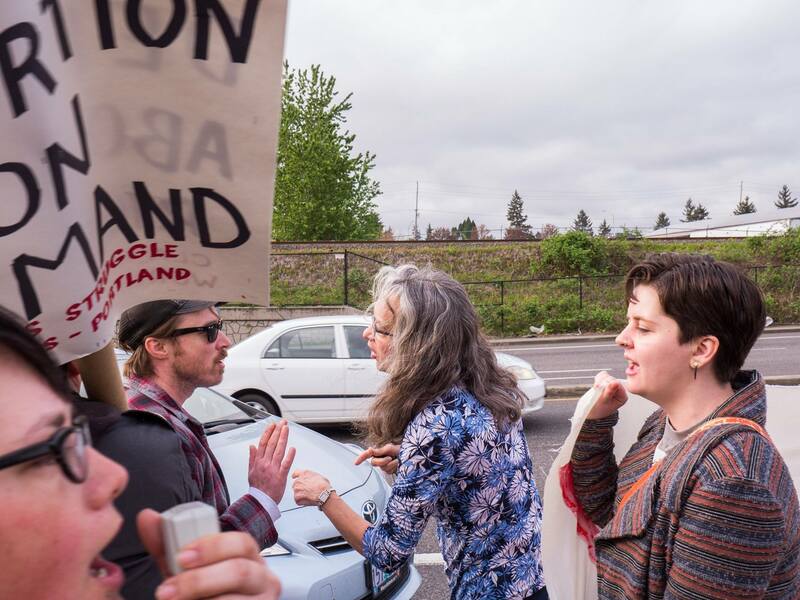 Class Struggle Workers – Portland calls on labor and all defenders of democratic, union, immigrants’ and women’s rights to mobilize against this dangerous provocation. The public face of this bogus “movement” is one Haley Adams, who is a YouTube figurehead for Joey Gibson’s fascistic “Patriot Prayer” outfit. She has been a constant presence at its rallies since it came on the scene in Portland on 29 April 2017. That same event was attended by Jeremy Christian, the Nazi who only a few weeks later murdered two men and nearly killed a third who came to the aid of two young Muslim women he was haranguing on a MAX train. These people are dangerous. The #HimToo hashtag spread on the Internet around the Senate hearings on Supreme Court nominee Brett Kavanaugh. It was claimed that this all-round reactionary was supposedly the “victim” of #MeToo feminists, yet Kavanaugh’s record shows him to be a virulent anti-immigrant, anti-labor, anti-abortion bigot and sexist pig. The real aim of the #HimToo hatefest not to counter false accusations of sexual abuse, but to put women back “in their place.” Several Patriot Prayer thugs and their local Proud Boy allies have been charged with domestic violence, cyberstalking and assault against women. Contrary to its lying propaganda, #HimToo crew is not defending free speech, due process or those unfairly accused. They are provocateurs who pose a clear and present danger to the rights of women, and a physical threat to all defenders of the oppressed. 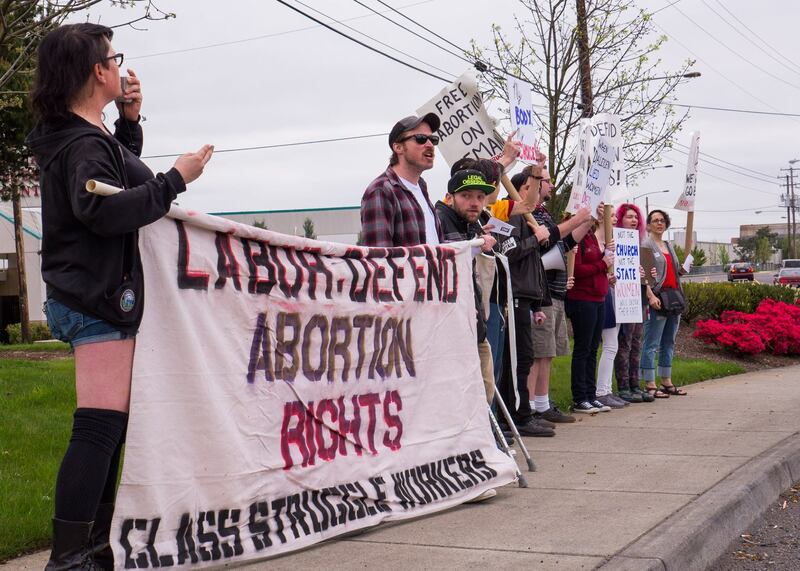 Class Struggle Workers – Portland calls to fight sexism and defend the rights of women. CSWP has mobilized labor defense of abortion rights and opposes discrimination against gays, lesbians or anyone on the basis of their sexuality. Today we call to bring out the power of labor to stop this woman-hating mob and defend women’s rights! February 28 – Educators and students gather in Brooklyn, NY outside meeting of Panel for Education Policy (PEP) to support and organize to defend our students. This update from Class Struggle Education Workers describes some of the efforts being made by class-struggle unionists to defend immigrants at NYC public schools and universities. 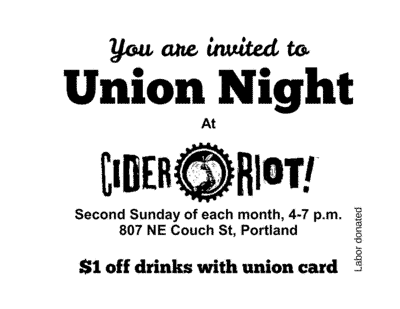 It’s time for unions in the Portland area to take similar measures. May Day in Portland, 2016: the Class Struggle contingent brought together Carpenters, Ironworkers, Stagehands, Teachers, IWW “Wobblies” and other pro-working class elements under the day’s only banner that called for “Full Citizenship Rights for all Immigrants,” on this workers’ holiday that was revived in the U.S. by the mass protests of immigrant workers ten years ago. The goal of the Class Struggle contingent was to fight for May Day as it should be: International Workers Day, a day for the class struggle against the capitalist system. 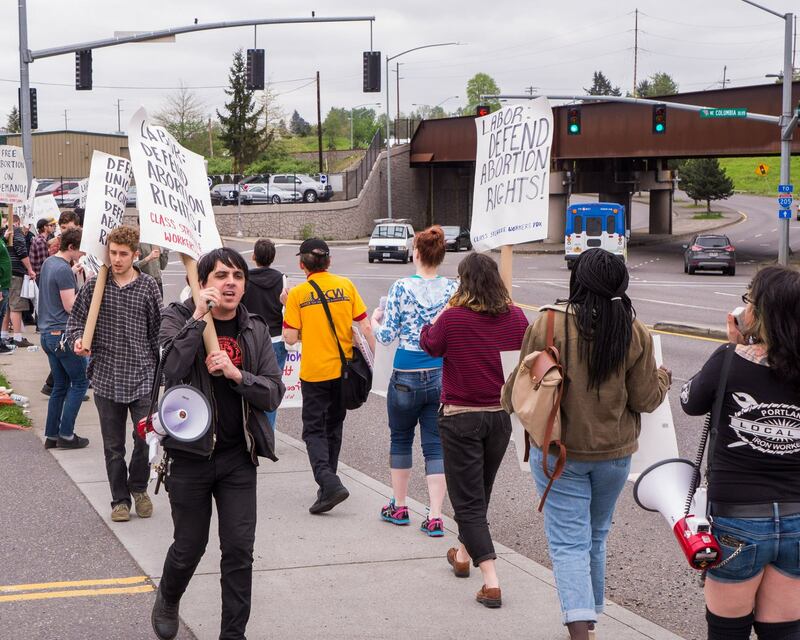 Our contingent was the only participant in Portland’s May Day that sought to mobilize the unions and the militant workers. And while there were some radical-sounding words to be heard from the platform, one of the main sponsors of the event was the “Working Families Party,” a scam operation with which the union bureaucracy seeks to get workers’ votes for the Democratic Party of our class enemy. The Class Struggle contingent’s banner said “Break with the Democrats and Republicans! For a Class-Struggle Workers Party!” We distributed many copies of our article against Bernie Sanders from Bridge City Militant No. 1. We were the only group at May Day that had anything to say against the ruling party of bloody, racist U.S. imperialism. A spokesperson for the Internationalist Group, part of the Class Struggle Contingent, was interviewed by KOIN 6 TV news and got right to the point: “We think that capitalism has long outlived its usefulness, and we think that we need a workers revolution in America.” That’s what May Day, and the class struggle, is for. 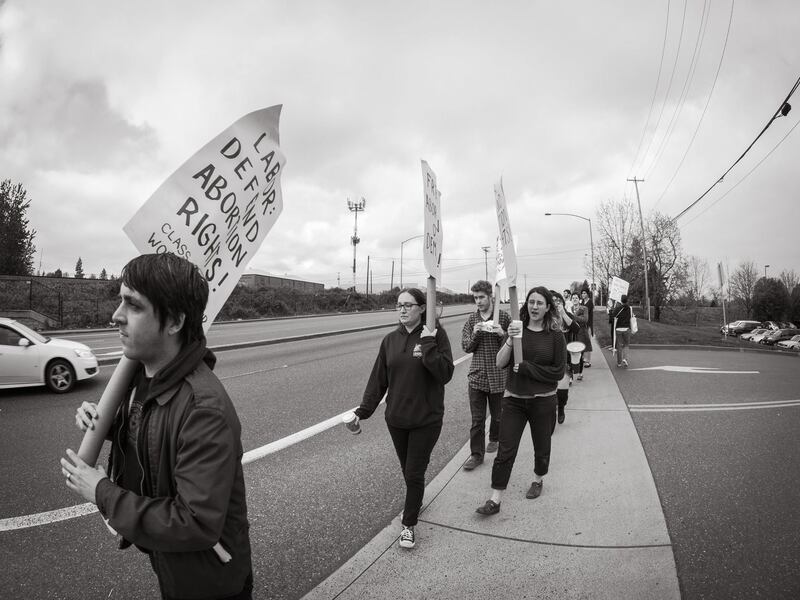 Saturday morning, 9 April 2016: A CSWP-organized picket confronted the conference of Oregon “Right to Life.” Members of Ironworkers, IWW, Painters, Stagehands, UFCW and other unions, along with students and women’s health professionals, slammed the conference that featured the vile anti-Semite Harmony Daws, and the discredited fraudster David Daleiden. A CSWP spokesman emphasized that Democrats as well as Republicans were enemies of the working class and of women’s rights, and called to unchain the power of organized labor by breaking with the parties of our class enemies and building a class-struggle workers party. Above: a supporter of the “pro-life” conference (center) repeatedly urged motorists to run down CSWP picketers. 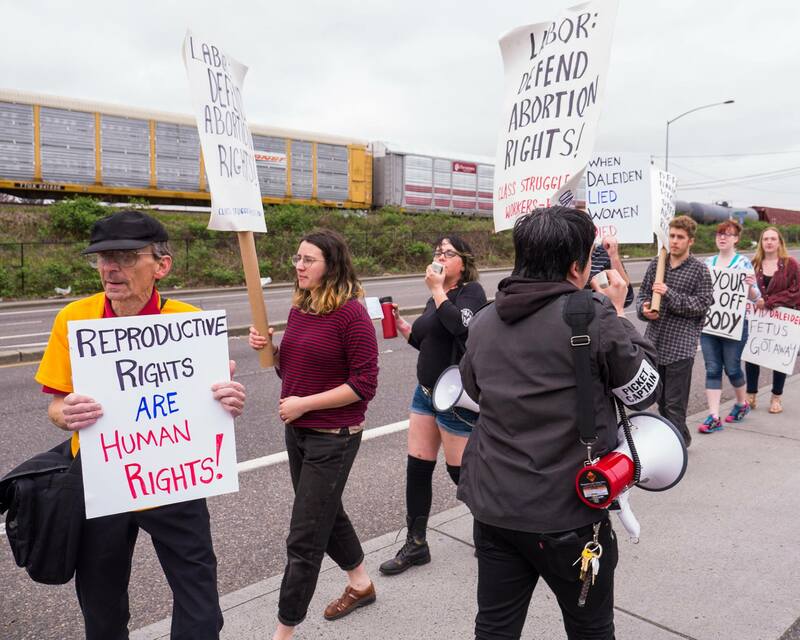 On Sunday, January 17, CSWP initiated a spirited picket line that shouted down an anti-abortion “youth rally” at a swank Portland Pearl District caterer. Union Carpenters, Ironworkers, Painters, Stagehands, Teachers, Wobblies, Portland Solidarity Network supporters and others turned out. 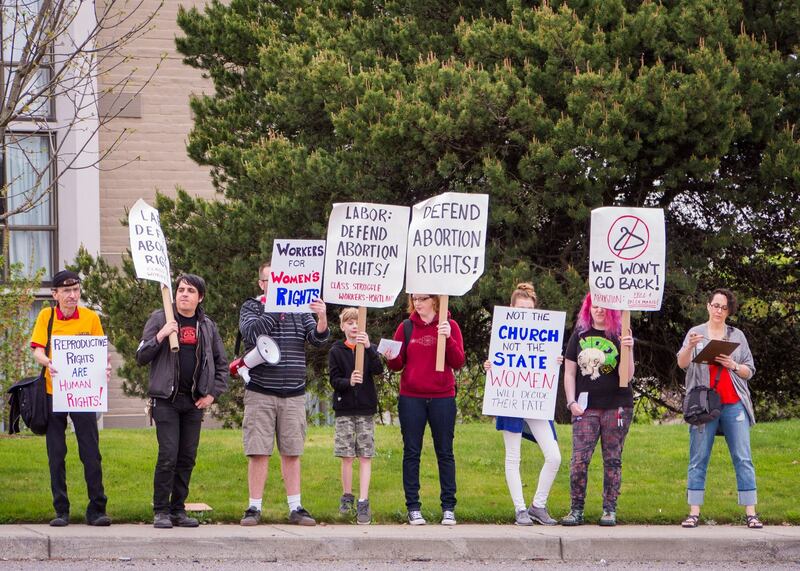 CSWP placards and chants demanded “Free Abortion On Demand” and “Labor: Defend Abortion Clinics.” Union militants intend for this action to be the beginning of organizing more solid and active labor defense of abortion rights. Speakers soapboxing at the picket emphasized the need to mobilize labor’s power in defense of the right to free abortion on demand, independent of and against all capitalist parties, Democrats and Republicans alike. CSWP pickets anti-abortion rally, 17 January 2016.